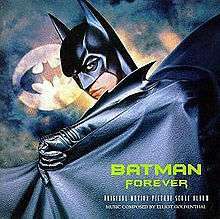 For the pop music soundtrack to the film, see Batman Forever (soundtrack). Batman Forever: Original Motion Picture Score Album is a 1995 Grammy nominated film score album for Batman Forever, composed by Elliot Goldenthal. It was released in conjunction with its soundtrack counterpart. The score features big brass, strings and discordant noises while maintaining an anthemic sound. On the U2 single "Hold Me, Thrill Me, Kiss Me, Kill Me", there is a track titled "Theme from Batman Forever" which was also composed by Goldenthal; this can also be found on the expanded release issued in 2012. La-La Land Records released Elliot Goldenthal's expanded score to Batman Forever on January 1, 2012. ↑ Movie Music UK review Archived January 12, 2010, at the Wayback Machine. ↑ Soundtrack-express review Archived February 2, 2008, at the Wayback Machine. ↑ "Batman Forever: Limited Edition (2CD-Set)". Lalalandrecords.com. Archived from the original on 2012-01-08. Retrieved 7 March 2011.